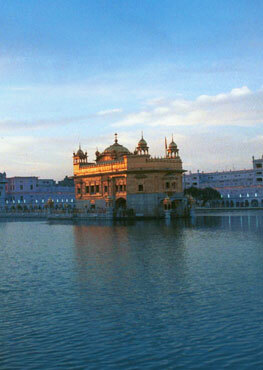 Fergusson considered the Golden Temple an example of the forms which Hindu temple architecture assumed in the nineteenth century. According to the official list of buildings of interest, published by the Punjab Government in 1875, the design of the temple, as reconstructed by Ranjit Singh, was borrowed from the shrine of Saint Mian Mir, near Lahore. Louis Rousselet, writing in 1882, regarded it as a "handsome style of architecture". Major Cole described it as an adaptation of Mohammadan styles, flavoured with a good deal of Hindu tradition. Percy Brown considered it to be a product of the synthesis of Hindu and Muslim influences, combined with elaborations that imparted it an appearance of its own. In the opinion of Hermann Goetz, Kangra transformation of Oudh architecture was taken over by the Sikhs and evolved into that wonderful, though occasionally gaudy, Indian 'rococo' art often seen in the gurudwaras of Punjab. The decorations which fall strictly in the category of mural painting are floral patterns interspersed with animal motifs. There are about 300 different patterns on the walls, which, from a distance, look like hung Persian carpets. The naqqashes, or painters, of these patterns had developed a terminology of their own to distinguish various designs. Among these the most prominent is known by the name of Dehin: a medium of expression of the imaginative study of the artist's own creation of idealised forms. Gharwanjh is the base of Dehin. This is also a decorative device involving knotted grapples between animals. 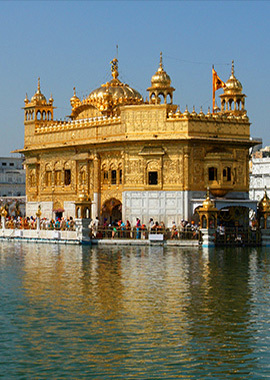 In the Golden Temple are seen Ghawanj showing cobras, lions and elephants clutching one another, carrying flower vases in which fruits and fairies have been depicted. Patta is a decorative border design used around the Dehin and often depicted through creepers. There are also compositions based on aquatic creatures. The only mural depicting human figures is to be seen on the wall behind the northern narrow stairway leading to the top of the shrine, representing Guru Gobind Singh on horseback. According to the late Bhai Gian Singh Naqqash, it was painted by a Kangra artist specially commissioned by Ranjit Singh for this purpose. It is said to be a true copy of a miniature painting that originally was in the collection of Raja Sansar Chand of Kangra, which Ranjit Singh had intended to get copied in the form of a mural in the Golden Temple. Since the artist of the miniature in question had already died, the mural was executed by the painter's grandson. The name of the painter, however, is not known. The ivory inlay work is to be seen only on the doors of the Darshani Deorhi. The gate is made of shisham wood, the front overlaid with silver, the back inlaid with ivory. The silver-plated front is ornamented only with panels. At the back are square and rectangular panels with geometrical and floral designs, in which are introduced birds, lions, tigers and deer. Some of the ivory inlay is coloured green and red, the effect being, in the words of H. H. Cole, "extremely harmonious." Efforts have also been made to renovate the decaying paintings in the, temple proper. But there appears not much reason to regret the loss, because, in the words of Michael Edwardes, the Golden Temple "is a symbol, glowing in richness and colour. That richness has, over the years, been constantly renewed, not always perhaps in the best of taste. But the Hari Mandir is not a museum. On the contrary, it is a shrine, part of the essential machinery of a living faith."